In 1991 I wrote a political satire entitled “In the Year 2252″ (P. Barber, pseudonym). Copies were circulated prematurely by a Chicago literary agent. 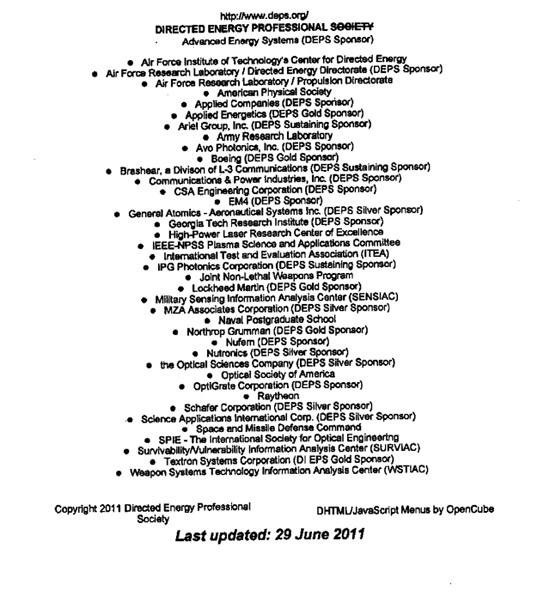 As a result, many publishers, editors and writers accessed copies. Before a second draft was prepared it was clear covert censorship would prevent any possibility of publication… I was already under 24 hour a day surveillance and was fielding feedback from corrupt sections of the entertainment industry; especially the media. While reading this account please keep in mind the wide reaching influence of covert agencies and organised crime throughout our community. A few “well placed” people in each area can create havoc for those being silenced. Others working with these criminals are too selfish, scared or apathetic to intervene. Also, because wealthy criminals may make false accusations I state, as fact, that not only have I never committed any wrongdoing whatsoever but I have never even contemplated any wrongdoing. I’ve responded to the harassment defensively but verbally, with indignation, anger and even humour but that’s all. Accordingly, any misinterpreted or “altered” writings etc should be ignored. (a) Learning (from the security/P.I industries) that the word was out to “wash your hands of it” meaning not to talk to me and (b) being referred to media identities (esp. T.V presenter M.Willesee) by one P.I who did investigate. Apparently, having sold his horse racing interests, he was to be trusted.? Having little knowledge of corruption in that industry or any other (including the drug trade/media/agency connection) I was puzzled by this. In any event, being unable to see M.Willesee I tried meeting some of his colleagues (see “Meetings” Jan 97). John Howard (Australian Liberal Prime Minister). Three people (incl. a senior Federal Police executive and an ex agency member) informed me that the Prime Minister “is aware of” the situation but that “his hands are tied”. Early in 1996 he did, in fact, ask the AFP to investigate the surveillance but they were unable to (efficiently) for “legal reasons”. Although I was told it was because the matter was “politically sensitive”. NB: If the media could “tune in” so could the AFP. They couldn’t help because of who is involved. Ros Chilvers (Ex agency / private investigator) – She spoke with Paul Keating when he was Labor Prime Minister and told me he was actually part of the vendetta against me. This is part of what makes it “awkward” for others to help. This and the Foreign Agency, Entertainment Industry connection. 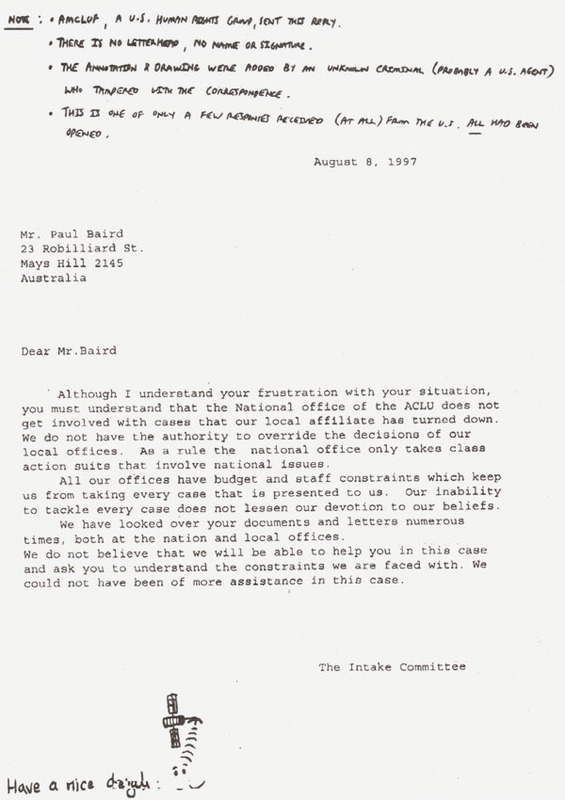 Warren College (Federal Cabinet Secretary’s Office) – He spoke with current PM, John Howard, who said the situation was “too awkward” (for him to intervene). It’s “awkward” because Federal Labor politicians, agency officials and the media ARE involved as are their counterparts in the US. It is, in fact, a criminal conspiracy of silence. 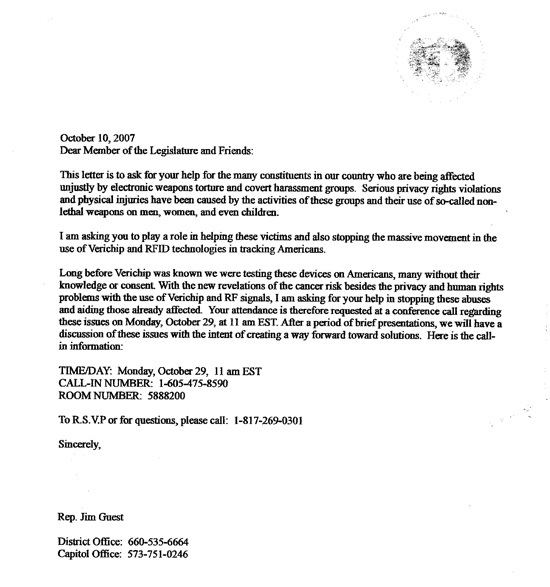 Steve Duffield (Ex Sen. Alston’s office) – He knew and tried to help. Within a week he was gone and cannot be found. Ms J. Bonner (Ex J. Howard’s office) – Knew but now refuses to discuss it; even with liberal staffers. Matt Francis (Sen. Newman’s office) – Said many working in politics knew I was monitored/harassed because of the book, adding it had ” opened his eyes” to realise the full extent of what actually goes on (i.e. political crimes). Mick Roberts (Ex AFP) – On his retirement he told me that he’d always believed me totally but there was a wall of secrecy which he couldn’t break through. No one would talk and it all “smells of journalists and politicians” he said. 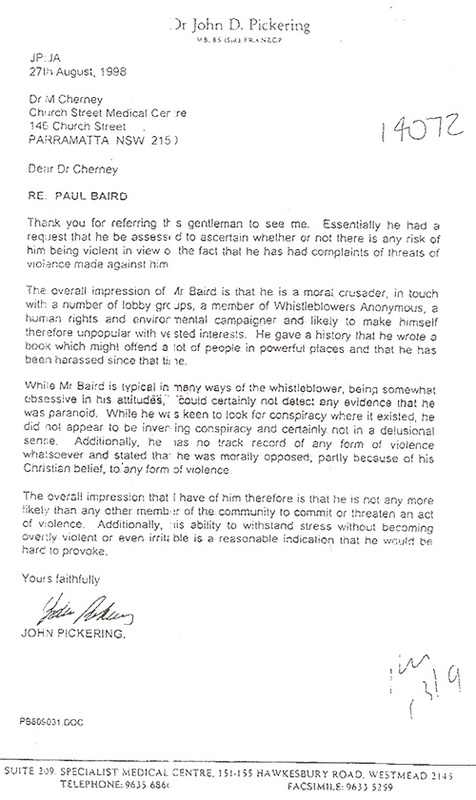 Nelson Chad (Investigator/Ex policeman) – Channel 9 journalists (in particular Ray Martin and others working on “A Current Affair”) were involved. This was even confirmed by one ACP director, Mr. G. Cubbin. 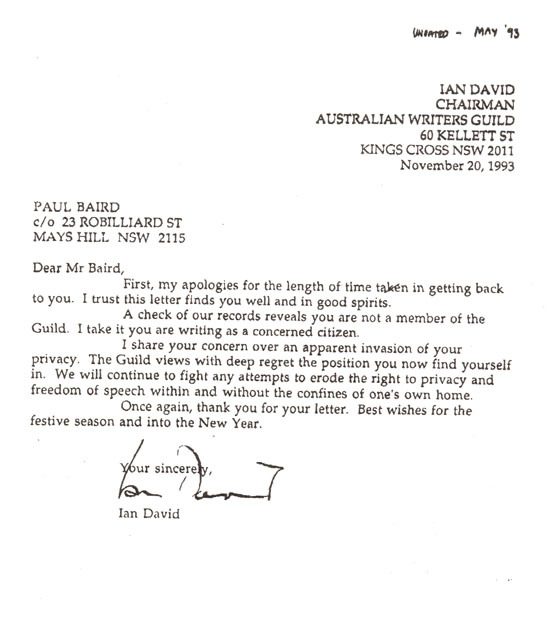 Note: Channel 9 owner, Kerry Packer is not the only media magnate who wants me silenced. No media player would want the general public becoming fully aware of the invasions of privacy and crimes which journalists and agency officials commit. 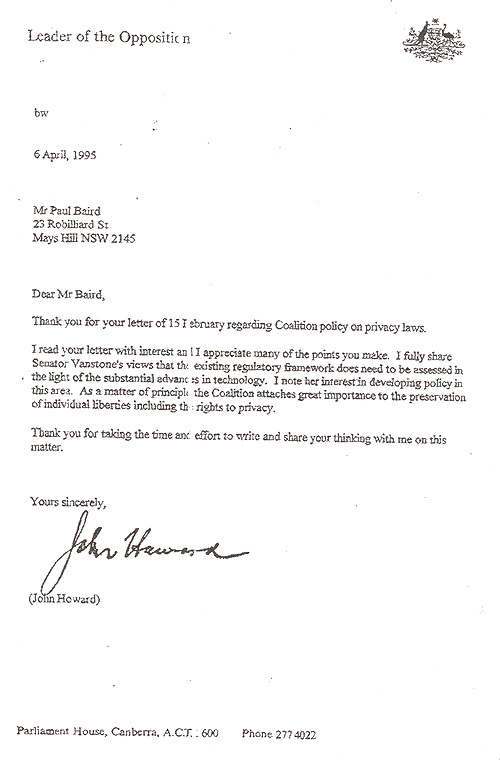 Remember, I lobbied heavily on privacy laws for years with John Howard himself supporting my views, in writing. ROSS SAUNDERS, ex head of religious programming at Ch 2. He confirmed all my suspicions about the media’s involvement and advised me. He was forced to move because of the covert harassment he endured. DAVID SANDERSON, B-Grade moviemaker. He called and volunteered to make a documentary on the covert, technological attacks on decent people who spoke/wrote about evil in high places. He said it sickened him…however, he and those he approached to help were frightened/blackmailed into dropping the plan completely. HOMI BAHRAMALI – Neuroscience/psychiatry – Westmead Hospital. He was working on his own neurophone so his harassment was largely due to his own work. He now works at The Centre For The Mind (Sydney Uni) but is cautious about offering real help to victims, for obvious reasons. SEAN EDWARDS, ex Special Branch (NSW Police) and AFP officers, Graham Cane, Mick Roberts, Jeff Sundin, Chris Woods and Mark Andrews also helped but weren’t harassed. Military aide to the Chief of the Australian Defence Force. He told me it was all “politically sensitive” and that foreign governments were involved. He said scanning targets with military grade oscillating scanners would be effective but embarrassing to the government which doesn’t want to know “officially”. He was transferred out to a Pacific Island for talking to me. He was my original contact and support. He was promoted to head of the diplomatic liaison unit and instructed that it wasn ‘t appropriate for him to talk to me directly any more. One of a few Catholic priests who admitted knowing of the situation. He said even the Church hierarchy was corrupt on matters like this, adding that he personally, would hate to have his brain waves monitored and interpreted. He was immediately transferred. After conceding that my tapes and accusations against CH 9’s ACA current affairs program were valid (they harass me with nightly surveillance feedback through their program) the entire committee disbanded, my tapes “disappeared” and the Chairman apologised saying that the new committee was to be made up of a group led by employees of the very program I’d complained about … Chris Smith etc. Although we didn’t talk he defended the truth I presented when interviewed about complaints to the Gov’t’s media enquiry; confirming that though I may have been the sole complainant to go public that there were many other victims of media privacy invasion that had complained. He was not the Minister a week later. Psychiatrist and inventor of his own Neurophone. He offered to scan 40 victims using hospital equipment warning that “they” may interfere with the results making victims look like victimisers. Despite declining his offer of help as too risky he was then made head of the Sydney Uni’ Brain Institute and suddenly saw “grey” not “Black and white” regarding the rights and wrongs of all of this. Since mid 1991 I have been kept from full-time gainful employment. This is despite the fact I have degrees in Law and Economics and a solid working background that includes time with The Chamber of Commerce, a major bank and the Australian taxation office. “Instructions” were probably circulated by those involved in criminal activities. (One private investigator told me the word was out that everyone was to “wash their hands” of the matter. No-one would dare help.) Many obstacles stand between me and real work although I have been “allowed” simple work: telemarketing. I’ve been followed and harassed by corrupt P.I.’s and police, however they have not accosted me at any stage. At crucial moments, crank phone calls come through to my home. Nothing is ever said. Silence… then they hang up. My mail (esp. from the USA) is often intercepted. IF I get it then it’s either opened/annotated or a reply of little consequence. eg: one letter had a drawing of a surveillance satellite monitoring me and the words “Have a nice day”. Helicopters and small planes deliberately “buzz” my home and follow (or even hover overhead) as I walk/drive. This can happen countless times on any given day or night in clear view of friends/relatives. This can be triggered by an event (eg. Going to the mailbox), a political statement I make in private (sometimes bringing in up to three “choppers” immediately) or a time of day (e.g. when a particular Channel 9 or Channel 7 current affairs program is running). Siren “wailing” can also be triggered in a similar manner to the aircraft harassment. Embarrassingly, these often coincide with trips to the bathroom etc. If I’m on the street, ambulances will wait on corners or stop their sirens as they approach me; often turning around (clearly going nowhere in particular). Occasionally public figures, who I’ve never met, would stare at me. e.g. At a function held at St George Leagues Club, Graham Richardson (Labor Party Numbers man and Ch 9 Employee) entered the auditorium from a side entrance and stared at me non-stop, as he walked through the room, all the way to the podium.There he delivered a jovial account of his own corruption. Now if I’d approached him for an explanation (or PM John Howard, who was also there), goons would of accosted me. This is not politics it’s oppression and it’s a crime. As is all similar intimidation, privacy invasion and harassment. NB: False alarms, corrupt dispatchers and bribes to pilots (for flight deviations) all help effect these forms of harassment. My enquiries revealed all of these are common practices. From 1991 until this day I have been under 24 hour a day satellite audio/visual surveillance. The results have been made available to politicians and journalists. Private investigators confirmed that ex PM, P. Keating and Channel 9 “A Current Affair” personnel were actively involved, but there were many others. (Notably some Labor politicians worked for Kerry Packer’s Channel 9 after retiring eg: Richardson, Hawke). Without their knowledge, my relatives were also frequently monitored in the early ’90’s. Notably by late 1996 the direct media monitoring of the (agency) signals stopped as more advanced satellite systems were employed. It is suspected this may be due to the fact that the Liberal government (elected March ’96) were not actively involved in the harassment so other means of attacking me were found. However I am uncertain of the precise reason. Countless speeches, news items, advertisements, scripts and “writings” have been peppered with my ideas/words/phrases. These came not only from the surveillance results but also the book which, though covertly “banned” by the criminals concerned, was also extensively “used” by many writers / editors; especially those working for Rupert Murdoch (eg: Harper Collins, the Telegraph etc). Not only did I find some TV executives that admitted such thefts and harassment techniques are used, but one even openly admitted his own people were partially to blame. Much of the feedback involves subtle but constant death threats. 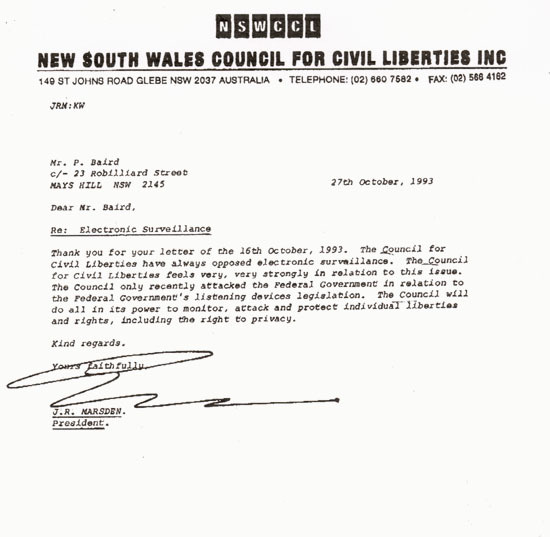 Many media personnel in Sydney were clearly informed of the relevant audio surveillance frequencies and were monitoring directly until late 1996. This was made most obvious by comments made by “live to air” broadcasters (TV / radio). Clearly the presenters were signalled and “fed”. With the advent of neurophone harassment and brain scanning (in my case) there was a less direct (delayed or relayed) feedback…as if the media could no longer directly monitor the signals. However, the speed of feedback picked up again in later years. In any event, the feedback of thoughts can be even more oppressive than the feedback of words…Both continue to this day. In my case, the switch (to more advanced monitoring systems) also coincided with the PM’s office instructing that I would no longer receive replies to my correspondence; though the significance may be minor. For all I know I may merely have been taking the place of another politically selected experimental target; for an illegal human research programme. PROMOS – eg: Kerry Packer’s ACP Director, Mr Graeme Cubbin, admitted that the “I AM CHANNEL 9″ promo was in fact aimed AT me. Many of the on air presenters working at 9 featured in that ad; I believe most knew what they were doing. PHRASES – eg: Just before “A Current Affair” ended on Channel 9 for 1992, then presenter Jana Wendt was quoted in a magazine as saying: “I guess I’ll go to my grave not being able to think past the end of my nose”, a comment I made (knowing it would be overheard) just prior to that interview (not exactly a common saying). And it was not the only reference in the article. Coincidences? Imagine such coincidences happening a dozen times a day – for years – and you’ll appreciate why this “parroting” is so useful to them. It’s extremely oppressive. DIRECT FEEDBACK – eg: On at least two memorable occasions I responded to “live” taunts by Channel 9 employees only to have the entire transmission cut completely and immediately. OTHER “COINCIDENCES” – eg: ACA, Ch.9 presenter, Ray Martin, ran an item on politicians who don’t answer correspondence. They suggested viewers use a company called Voterlobby. Also, on the day my mum received her cancer test results (Aug 04) Dr John Holts “cancer” treatments featured on Ch9’s A.C.A. Subsequent items on Dr Holt coincided with treatment milestones for my mum. Cynical attacks like this test your patience and prove that those behind the harassment will stop at nothing. Remember, PI’s AFP officers and even one Channel 9 director had admitted to me that a Ch 9 ACA personnel were involved. Then presenter J. Wendt delivered constant feedback / coincidences for years; fed by agency/syndicate writers, researchers etc. She was not the only one… whichever programs I viewed would join in but the current affairs shows were the worst. A security guard tried to prevent our appointment taking place; under instructions from an “unknown” outside caller. Similarly, Minehan was interrupted constantly by phone calls. On the last call he slammed the phone down exclaiming: “They’re telling me to get out. Now!” However he had already told me that my situation was “not uncommon”. He suggested I see Jana Wendt. He seemed genuinely worried. Although it seems naïve now, at the time I thought journalists (et al) may help re the brainwave/neurophone torture. I even contacted one or two who had personally harassed me with surveillance feedback. “Wendt was approached firstly because, although she’d harassed me, she was fighting with Ch7 execs at the time and I thought she may be disgruntled enough to help me; esp. as the level of harassment had recently escalated considerably. Secondly, one of her predecessors, Mike Minehan, who seemed genuine, suggested that I should contact her. As I neared her Eastwood office I saw her in the street and introduced myself. She said to meet her in her office in one hour. However, during that hour she was called to the station and dismissed. I was also harassed. Seeing this as a clear attempt to stop her talking to me I located her home through her partner’s details and arrived to find her having a music lesson. She warned me that TV execs control everything, including her, but, rather than refusing to talk, suggested I call her secretary for an appointment. It would have been more honest to say “Go away. I won’t help you” I’d been lured into a mincer and what followed was probably set up by Messrs David Leckie, Ch 7 GM, and Rice who both went from Ch 9 to Ch7 with Wendt). Eastwood police later harassed me, at the request of their “friends” at Ch.7. They refused to speak to Wendt personally. I was told not to make any appointment and was taken to a psychiatric hospital as a “warning”. Before I was assessed and released (by a bemused psychiatrist who saw no reason for my being there at all) “knowledgeable” staff told me that at least six others who sought assistance from Wendt had also been sent there. “This is what you get for crossing them “said one senior nurse. (They knew yet co-operated). An FOI request indicated that Detectives Pollock and Spurr were warning me on behalf of Ch7 execs but Police Internal Affairs did nothing (esp. as TV identities were involved). I also discovered that the Police “psych” (a Dr. R. Burek) had claimed that our 3 minute discussion took 45 mins and had later tried to erase his annotation claiming I suffered from “auditory hallucinations”. He had to try to remove it before I got it because I hadn’t mentioned that to anyone during the incident, including him. The honest psychiatrist at the hospital who had let me go also observed this but left it to me to pursue the corrupt parties. Since this worrying episode I have learnt much about the role of mainstream media identities from agency officials, on-air targets etc. Little wonder suppression and oppression are rife in this country (and many other western “democracies”). The media mafia has far too much power. While I waited at reception Mr Packer and his son exited the car park and took the lift; James Packer looking back at me before disappearing into the elevator. Six goons then surrounded me, the leader claiming I’d been up to Packer’s 3rd floor office six times. (I wasn’t even sure Packer would be there. Also, this was my only visit and I was on the ground floor). When I scoffed, asking for proof of this lie, he said “Oh just get out anyway”. I did. I wasn’t going to give them an excuse to set something up. N.B. Because of these experiences no further attempts have been made to resolve this situation face to face. Employees of media magnates, Singleton, Packer and Murdoch are all involved in my situation. Some, I’m told, are also involved heavily in the drug trade (hence the mafia / C.I.A links, and the technology access). It’s also worth noting that in 1990-91, when this all started, all three media bosses were staunchly behind the Australian Labor Party; the central source of the problem. However, employees of others, like Ch 7 owner Kerry Stokes, were also clearly involved. My own situation is known to many and some of the more bizarre/significant “coincidences” have been deliberately omitted. However, the brief illustration has hopefully served its purpose. Like the covert agencies themselves (especially the CIA, Office of Homeland Security), those using surveillance results to torment innocent people are little more than modern day (electronic) Nazis. Many are prominent public figures with no fear of the law and little or no respect for others. Controlling public perception / opinion through such people is a priority for both the agencies and those whose interests they protect. Obviously only those who are “co-operative” gain prominent positions within the relevant media circles. In fact some sections of the media are responsible for gross human rights abuses including (ironically) the suppression of free speech. Once again, freedom of the press should not grant a freedom to oppress. NB: If a target is relatively unaffected by the media feedback or “tunes out” to all media / entertainment output (to avoid the feedback / harassment) then other, more advanced forms of harassment (like the neurophone and brain wave analysers) can take their place. This switch may also occur if the agency / criminals responsible wish to prevent direct monitoring of their frequencies by the media, Federal Police etc (for whatever reason). In fact remote neural monitoring (RNM) uses the brain as a transmitter (and receiver). In Mengele-like experiments, targets are used and sometimes killed. Those surviving, like ex-members of secret societies, agencies etc, are discredited to negate the truth of their claims. Although I am of the Catholic faith, and was subtly ridiculed for that, the Catholic Church (which is closely aligned with the Australian Labor Party, which fostered the situation) has also harassed me using the results of the surveillance. While some priests were sympathetic (one even admitting he’d heard about the “banned” book), others did as the church hierarchy instructed. The links between the church, the Labor party and overseas crime figures are well known. There may have been some “pressure” applied. Like other hypocrites and users corrupt members of the wealthy Catholic hierarchy will use and abuse the word of God (and his children) to get their way. Even sainted persons like Mary McKillop, today used for sainty ‘cover” were once persecuted for daring to speak their mind. Like other deluded megalomaniacs, many in the church live far from ‘Christ-like’ lives. To victimise people criminally for their views, is inexcusable and evil. If Christ were here today he would also be persecuted by these vipers. It is interesting that one of the guilty priests, an ex bikie named Kevin Lee, was chosen as a contestant on the Pentridge Jail Challenge run by A. Denton, Radio 2mmm, Nov 2001. Apparently he won. Odd coincidences like this were common in the early 90s. (I wonder who else he harassed). Since September 1996, I’ve been receiving constant/clear threats and propaganda from an unknown agency/criminal source; probably the CIA, Office of Homeland Security. This method of “torture” (which seems to be known to many political/media entities) is usually delivered courtesy of a satellite which tracks you, personally. A laser directs live talk, noise and computer-generated music at the body. It travels the nervous system as electrical impulses and registers in the brain; bypassing normal hearing mechanisms. Only the target hears it. Prominent journalists and senior federal police say it’s “not uncommon” and I know there are thousands of political victims in the USA and hundreds here. The motives for this form of oppression seem to go beyond providing an “annoyance”. The hope “seems” to be that the victim will be discredited if they react badly to the verbal taunts OR approach the wrong people for assistance. For example, media “mafia” personnel, politically naïve medicos or ignorant police could make matters worse. In the US, where the authorities refuse to concede their own government encourages such activities, the complainants are often committed. Meanwhile, senior federal police, some political aides and human rights activists are the most supportive here. Many are honest enough to admit they know which technologies big brother agencies and criminals can access. However practical help cannot be offered. Also since September 1996, I’ve been humiliated as a target of an experimental technology (again, satellite based) which allows the magnetic field around your head to be monitored. This powerful scanning and tracking system delivers the results to an unknown (probably US) facility with an advanced computer system capable of interpreting the brain wave patterns it receives; instantaneously. The aural feedback then makes for a means of remote interrogation and/or psychological torture. Combined with audio/visual surveillance the overall situation is like being in an electronic POW camp. One senior AFP executive said this may continue for many years and they are powerless to stop it. The human rights abuses I’m experiencing are considerable. However, what concerns me most is that ostensibly democratic governments can allow the development and “use” of such evil technologies to stifle free speech. 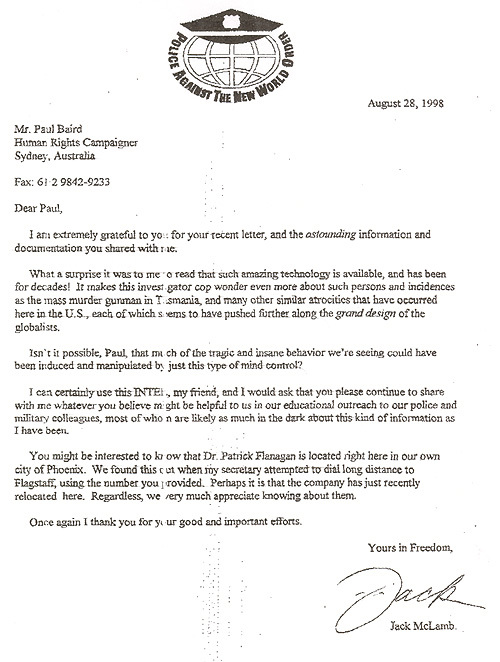 Although I never met either man Neurosurgeon/psychiatrist, Alistair Stuart and Black Mountain Tower (Canberra) chief technician, Bill Roy were both threatened, harassed then killed for trying to disclose information on high tech surveillance/harassment (Bill’s area) and political psychiatry (Alistair’s concern). The extreme measures taken to stop good men who would have spoken with knowledge AND authority serves as a warning to others. It, of course, doesn’t excuse the active participation of so many criminals in public life who help repress and destroy decent people merely for speaking the truth…Instead of helping, the media are the worst protagonists. They’re antagonists, not allies, of the truth and those that seek it. Many public figures betray us by their silence on these matters. Many politicians/journalists are actively oppressing others themselves; by stealth. And you won’t read about it because the media are themselves part of the problem. I have over 4,000 victims on my help files. Correspondence with other campaigners indicates 1/2 million are targeted worldwide. Despite the campaigning / efforts of nearly 1,000 advocates for privacy and human rights (who try to spread information via the net etc) the perpetrators use countermeasures to mislead both victims and potential future investigators. Firstly, acts like The Inventions Secrecy Act, 1951 (US) conceal over 5,000 secret technologies. The general public is therefore only aware of a small fraction of what’s possible in this world. National Security legislation and more helps to keep the truth from the people. One harsh truth, for example, is that there are currently over 20,000 satellites aimed back at the earth many facilitating high tech’ harassment of innocent civilians in order to silence them. Weather forecasts/communications and so on are used as the covers but much of what is out there is misused. As well as this those responsible also commission agency personnel to set up misinformation sites and filter lies through the controlled media. For example, if you search under “hearing voices” you’ll be bombarded with nonsense about schizophrenia. If you search under “mind reading” you’ll get rubbish about psychics. To find sites like my/this one (which detail information on hidden technologies) is thus made extra difficult. Added to this is the treachery and lying of the politicians and journalists who know full well what the truth is yet remain silent and complicit because it suits their own evil purposes. Coincidences are also arranged not only to make the victims appear paranoid but also to discredit whatever they’ve said or done to draw attention in the first place. Eg. The catalyst for my own harassment was my unpublished book “In the year 2252″, written in 1990-91 and circulated to agents and publishers in 1991. The book was thoroughly “used” piece by piece by different writers. In this way if I ever published it it would appear that I had stolen ideas from them. A good example of how this is subtlely arranged can be seen if you search under the title of the book..”In the year 2252″ …(Something many people would do if it was published).References come up to the same year (2252) for events in popular sci fi pieces written AFTER my book; eg modern movies/episodes of Star Trek, Dr Who etc written post 1991. (I don’t watch any of these by the way but discovered this by scanning the web). What are the odds against that being a coincidence? Yet since I’m not a public figure and those involved either are public figures or work with them their celebrity would win out and the truth would be lost. Finally, it may be worth noting the comments of a senior investigator from NASA’s Inspector General’s office. Having conceded the existence of the technologies mentioned in these pages AND commenting on the evil uses made of such anti-personnel weaponry he advised: “I suggest you pray”. Please contact the UN, the International Red Cross or Amnesty International to express your concerns. Victims or concerned citizens can also contact the ACLU, ACHES, FFCHS, CAMS, ICESH, Mind Justice, CAHRA, The European Parliament and UNIDIR. The following reflect some of the discussions that I've had with professionals that are aware of covert surveillance and harassment technologies. All acknowledged the problem and most were good, honest people in difficult jobs but it's their added political comments that are the main focus here....Many names have to be withheld for obvious reasons and quotations, from memory, are paraphrased and approximate. The circumstances surrounding meetings will sometimes be relayed to give a context. Also, the people who held the positions of PM, Police Commissioner etc clearly changed over time so where one may be hostile another may actually be helpful. The overall message is that this is politics first and foremost; political psychiatry, political oppression, political crime. Science is employed but politics is the reason for choosing the targets. * AFP (Australian FBI)..(NH) - Head of surveillance unit - "Even if a head of state or a Prime Minister was to wade in on these matters they would be out of office that same day. That is what you're up against here". When I asked who was primarily responsible for these crimes, spy agencies, the military, politicians or journalists, he answered ..."Well, they all have ready access", meaning all of the above. With this he confirmed my earliest observations that this was elitist / class crime directed by criminals in high places at those who challenged them in some way. * AFP - Diplomatic Liaison unit - Various (G. Cane, J. Sundin, M. Andrews, C. Woods) - "The files of genuine complainants are marked "POLITICALLY SENSITIVE" as foreign governments and local politicians are involved"....All of these men were transferred after talking to me. One was promoted on the proviso he never talk to me again. * AFP - Mick Roberts (retired) - "It all smells of politicians and journalists. They're above the law and we can't get them to co-operate with investigations. We work for the government of the day and my hands are tied. That's why I quit". He added that my own case was clearly a genuine conspiracy of silence. 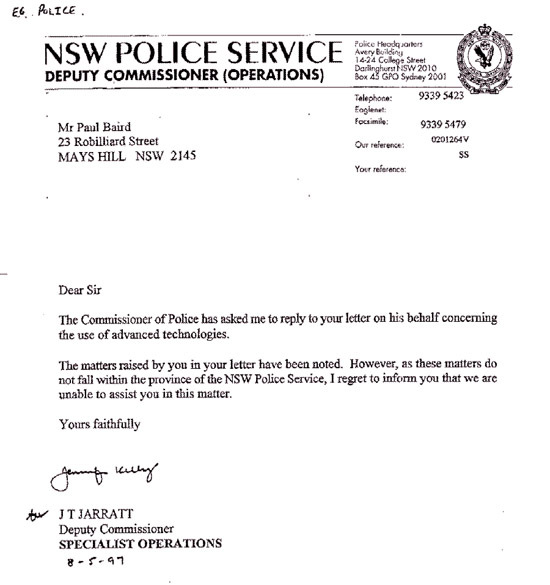 * NSW Police Commissioner Bev Lawson (dec'd) - "If I make so much as a move in the direction of that large filing cabinet over there, the one with all the information on serious criminals, then people in high places will know...not because I can't trust my staff or even due to computer monitoring but because their connections see and tell them (looking skyward and gesturing to indicate eye in the sky technology). I don't have to say or communicate anything, they know". She died suddenly of a heart attack while acting Commissioner. A good woman in a bad position. * Sean Edwards - NSW Special Branch - "Don't ever trust a politician or a journalist. Our files are filled with their crimes but they are untouchable. Especially don't ever try to speak with the Premier". The Premier later disbanded the Special Branch unit, claiming it was corrupt (which it was but only at the top) and he destroyed ALL the files. * Newcastle area Commander - "Yes, they kill people, shoot down planes and such as warnings to targets or heads of state and such; people they cannot safely threaten openly", he said. In context, two men had just been burnt in a cherrypicker right near my home as I was preparing a sensitive piece. I thought it suspicious but I would only speak with the top man. As I approached the Commander's office to keep our appointment countless cherrypickers lined both sides of the street and they rose exactly as I passed; dozens of them...one each side of the road would rise then, as I got to the next poles another two and so forth...until I had passed and all were up... A highway patrol cop pulled me over in a blind spot and threatened me as he unclipped and caressed his holster. All this discouragement aside, I pushed on and eventually spoke to the Commander; we exchanged information. Mid discussion the Police Commissioner called (not Bev Lawson, a predecessor) and told him to shut up and get me out of his office (a familiar response). An interesting and revealing day. * Australian Crime Commission - Chief officer admitted they knew then changed his mind after being told by a superior to shut up. * FBI officer - Said he wouldn't be surprised what the CIA got up to and added that he did not trust anyone working for them. * US Embassy in Canberra - Chief US spy in Australia - Standing on the lawn outside (they would not have me in the building) and looking skyward then panning his hand across the city skyline below he bragged: "I know everything that happens in every office in this city. Everything. Understand?" I wrote to every Federal MP and told them what he had said. None responded. All are clearly compromised by the surveillance. * British naval intelligence officer - "All ex military employees are monitored 24/7 for a minimum of 2 years to ensure they settle back into civilian life and do not blow the whistle or write a book or anything else". * Paul Beaumont - Chief Aide to head of the Aus' armed forces - "The army has oscillating scanners and such that can detect if anyone's being interfered with, as do major universities / hospitals etc. However, we cannot use them to help you or anyone else as it's "POLITICALLY SENSITIVE"; foreign government agencies are involved and it would be embarrassing to catch them out". He was immediately transferred to the South Pacific for even talking to me. in a prominent position will stand against such an order. in your case". In context, indicating that senior politicians will destroy targets. * Retired politician (Mr C) - "Back in my day there were still some good men in the parliament but not now. The surveillance compromises all of them and keeps the good ones out". * Retired independent politician (J H) - One of the rare breed of quasi honest politicians. "I fought my battles; this one's yours", he said so I asked if he knew of any other honest politicians he could recommend and there was stoney silence. "You're kidding", I said. "What about you". He replied quietly, with regret: "I did my best". seem to know who you are and what's happening. This one's opened my eyes to just how corrupt politics can be". Needless to say he was gone soon after. * Federal Cabinet Secretary (Warren College) - "The PM knows but it is too awkward for him to intervene"...a sentiment echoed by others, including those on the PM's personal staff. Again, in context, indicating the scale of these conspiracies and the fact that they are not rare but commonplace. * NASA Inspector General's Office - After admitting that they knew all about NASA's role in delivering payloads into space and the capabilities of the satellite technology in question and being asked what could be done to stop them I was told: "Nothing. I suggest you pray". This was repeated as I was clearly incredulous. It was said with resignation and certainty as the only solution. This more than any other comment from any other source summed up the difficulty of the situation faced by all targeted persons. * Newsroom Supervisor, Channel 10 (JH) - "They send surveillance results in here, phrases, ideas, etc, with an instruction like "Find a place for this on tonights news or current affairs show"...Money and favours are exchanged...maybe a celebrity interview is set up or whatever. I'm telling you because I personally disapprove and will not do this but most others in TV / radio journalism will do it". He then escorted me out of the station before anyone else knew he had spoken to me. * Mike Minehan (Ex ACA current affairs TV presenter) - "It's not uncommon" he said, referring to the surveillance feedback and harassment. Before our appointment security tried to throw me out and every minute or so he received calls telling him to get me out of there until the final threat worked and he stopped talking to me. He wished me good luck but was clearly frightened by the final threat. The appointment took place not at a TV station but a University, during the holidays. Security later told me they had received similar calls from unknown callers outside. * Chairman of the Aus'n Journalists Association Judiciary Committee - After the committee viewed the tapes I had (proving surveillance feedback from the ACA program) the entire committee resigned. He called to apologise, saying my tapes had been "lost" and that the new committee would be chaired by one of the very ACA people I had complained about. * ACA presenter (JW) - "Execs control everything... editorial content etc". * Many other radio and TV personnel, from technicians to on air presenters, indicated that feeding back surveillance results was common and predated the more sophisticated surveillance and harassment methods now experienced by many. * Homi Bahramali - Neuroscience - Westmead Hospital - He invented his own neurophone, for which he was harassed, and said he could scan for interference but only if he could call it research, with over 40 in a group, as the equipment was very expensive and access was restricted. The catch was that while scanning took place the monitors could use the technology at their disposal to either temporarily stop the scanning or alter the brain wave patterns of the ones being scanned to reflect the bws of criminals on the files and then the scanner would automatically be forced to report the target as a potential criminal; a tidy set up. * Neurologist (JH) - "Illegal researchers used to plant scanners in their computer screens or wall cavities to scan patients' brain waves without their knowledge. Nowadays the bulk of the research is done by the US military scanning brain waves with powerful satellite technology. (Some Universities, hospitals and jails work in with them). If you tell anyone I told you this I will deny it. I have a young family and a career to think of". * Psychiatrist running an institution and his assistants - "Do not trust any journalist. We know for a fact that one in particular has lied and sent half a dozen good, sane people to us to silence and discredit them. This is what they do to those that dare to cross them". * Legal Aid - "It's common for corporate criminals to covertly harass and blacklist people and many of them wind up on the street. They enjoy seeing that as they present as hopeless / mad. I'm only using this job as a stepping stone and have a family. If I try to help any of those I know they did this to or spill the beans my career will stall". * Lawyer / Partner - "We've discussed it and would dearly like to help but if we do "They" will come at us from the side; we'll lose all clients from any connected source and that means we'd be out of business". * Filmmaker - Hollywood (DS) - "Hollywood is in on this and I'm sick to death of it. I'm going to make a film that exposes this". (No, he didn't and all involved in the failed project suffered heavily). * Filmmaker - Aust' - "Even if a TV presenter or someone else running a live TV / Radio program were to do a "Network" (referring to the Peter Finch movie) and start telling the public the truth about surveillance etc. they'd be yanked off air, as the plug is pulled, and the headlines the next day would read: "TV presenter has on air breakdown"". * World famous pianist (RW) - "The only way out of this sort of harassment is to have money or influence. I myself was harassed but escaped through my playing and the notoriety it brought. I suggest others with any sort of talent should do the same". * Catholic priest (PL) - "The churches are like any other hierarchy, be it political, military, business etc, they too are corrupt and will do terrible things or co-operate. I certainly would not like to have my thoughts monitored either so...". * Ambulance service internal affairs - "Don't think that because they save lives that our people are beyond committing acts of harassment. I come across it all the time. The trouble is they usually get their instructions through corrupt union reps who are connected to the ones doing the surveillance and when I try to catch them out they know I'm there and stop, temporarily." * Chief - Helicopter service - "The thing is choppers don't lodge flight paths here and they can buzz anyone and get away with it". Overall problem...CIA stats say 60% of all people will now do anything they're asked without question so long as there's a benefit in it for them; job, money, influence etc. Whatever corrupt organisation is involved all they have to do is recruit from that 60% and ignore the rest. When one slips through (a whistleblower etc) they are dealt with. Also, the agreements that people sign when entering the armed forces, spy agencies, police etc force people to surrender their right to make a conscientious objection to an order. "There has been more damage done, more evil committed, by people following orders than by those that refuse to do so". Brendan O'Connor, The Federal Privacy Minister, defended me against a journalist who wrote that since I was the only one to make a public submission that privacy invasions of this sort were rare. Mr. O'Connor said many had lodged complaints, mostly naming the media, but all others were too scared to make them public. He was not in the cabinet / ministry the next week".